I'll throw another one on the grill if you're hungry. I've heard of 'pressed ham' and 'canned ham' before, but THIS is ridiculous, Melissa M. P.S., it's not staged, those hams crawled up thar like that! I want to nom those little feets! This is all too redonk, I can't stop laughing. I don't get it. What am I seeing? Did the owner squash them this way for a photo op? Can someone 'splainy to me what exactly I'm looking at? What is that blue thing? And is it wrong that I want to nom on their noses? This borders on cruelty. You really shouldn't be encouraging more of this by posting this. The first pic is hilarious, but that 2nd one w/ the 2 of them is just pushing it to laughing hysterics!! That is just too much!!! My hammy skippy used to do that too...-- it's two hamsters squished up behind their wheel, probably taking a nap. i'm sure the owner didn't put them there, hammys don't like being squished into places. There's no way that the owner could have put them there and have them stay still long enough for a picture. Anyone who has every owned a hamster knows this. If they were forced into that space, they would be squirming all over the place. The look relaxed in the picture, and I'm positive they are napping. Hey, one more and it's connect four!! When I was younger I had a hammy that did the same thing. Actually he seemd to like to find places to squish himself into for naps, he rarely napped in any 'normal' spots. Their bodies are made to squish into odd places and mine seemed to get a lot of joy out of doing just that. Alright, I'm calling off the angry mob. Villagers, put down your pitchforks. Chanpon, there are three kinds of people in the world. Those who are good at math and those who aren't. Ok, so that blue thing is the back of the wheel! Thanks for clearing that up, stronggrace. I've never see the back of one of those things and thought it looked like some weird propeller thingy. ahahaha is this the hammy equivalent of cats that squarsh themselves into tiny lil boxes? So cute. They look all comfy, weird as that sounds. I'm impressed the photographer had the willpower to get his or her camera. I would have tickled those little feets and woken them up! I'm afraid you'll need to coral us with more than that! These pics made me laugh, haha. I bet Andrew Zimmern had these before! lol! Oh, how precious are they?! Hahaha, that's so funny and cute and hilariously cute!! Oh my gosh, this picture makes me happy. I just wanna know why? milly- yeah, they can. but a hammy's gonna do what a hally's gonna do, and usually it comes out ok, luckily. thanks for the downer, milly. geez. Milly, it is possible that your friend's hammie was taking a nap behind the wheel and died in it's sleep. My daughter's hamster was curled up in her nappy corner and never woke up. At least she died peacefully. Hammies are good at getting themselves out of tight spots. 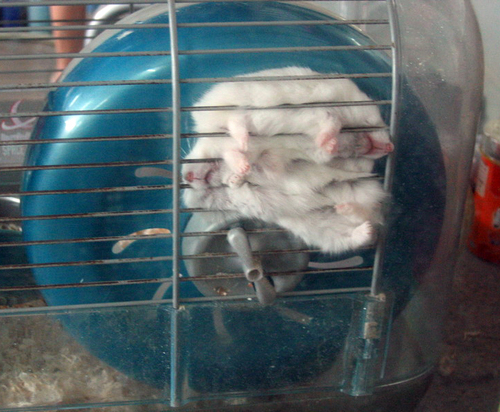 haha my hammyhams used to do this on the top of her wheel, and just lay there all crammed in and uncomftabuls-looking. so sillies! Annie-MUSTARD?? Who puts mustard on a hammy sammich? What you want is a nice cranberry chutney! Agree, Michelle. These hams need their version of boxhab-is it grill-ham, or ham-grill? Either way, it will be mistaken for an edible delight. Grillhab, grillham, wheelhab. That's it, wheelhab-can cover front of wheel or back. Nah, wheelhab should be for those hams who run all the time. Grillhab is for this situation pictured. If they can gets they little heads in, the rest of they bodies will follow. I had a hamster who loved to do this. One day she accidentally suffocated herself :( So I would watch to make sure your hamsters are okay and possibly even discourage it. What a perfect opportunity to nom on the little pink feetsies! @cheesybird - LOL! In my defense, the hammie on the bottom is a little ..um... "wide". I seriously thought he was two hammies until I counted the feet sticking out. Jesus frappacino christ peoples, use your common sense and read some posts before you assume this truly is a cruel grilled ham'n'cheese contraption. GAWD. I just would want to tickle the little peenk toesies and nosies!!! What, you mean you've never taken a nap underneath your car before? I know that Cage! That's the hammie space station! Easiest cage in the world to clean! 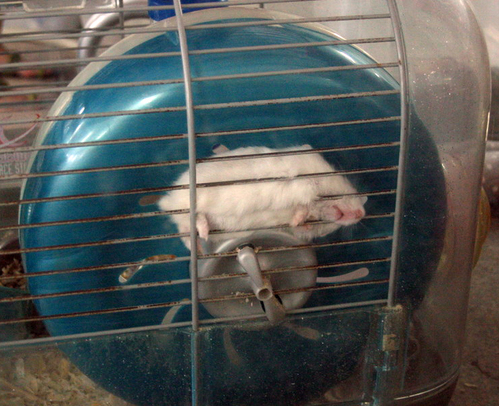 er - sorry, anyway - I had a full sized ham who used to do the exact same thing - in that exact same type of cage behind that exact same kind of wheel. I thought she was dead the first time I found her like that but nope - just happy and smooshed. Eventually she did it so often the wheel fell off its spoke. She'd gotten a little... er, 'fluffy' by then. "there are three kinds of people in the world. Those who are good at math and those who aren't. " cheesybird = best comment ever! O_o okay... how the heck did they get in that position? Im confused. they look comfortable but yet they look to squished.. they are so adorable from that view though, my hammy was lying on his back while he was sleep today and was kicking his little feet in the air, so cute! 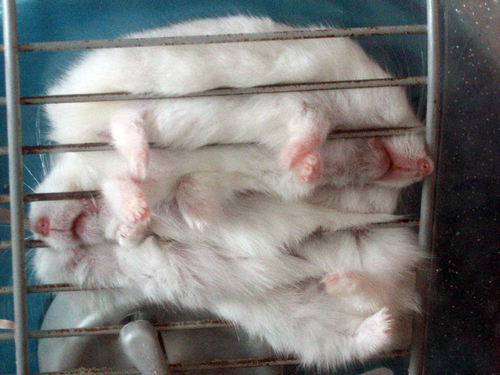 My gerbils were always finding redonkulous positions to squish themselves. They'd squish themselves three across a plastic pipe to nap and cause traffic jams. Them thar critters have jello bones. How the h*** do they extract themselves out of there.
" pardon me" " excuse me " "ouch" " easy there will ya"
When my kitties are lying next to metal or tile, my immediate reaction is to turn up the A/C. Turn us over. We're done on this side. OMG! I just want to ticky those little feeties!